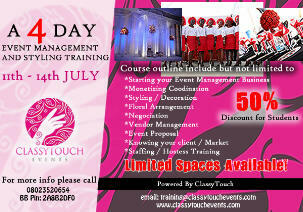 Make your Event Management dream come true by being a part of the ClassyTouch training. Learn how to: Start yours, make money with little or no capital, Manage Vendors, Staffing, Contracts, Negotiation, Get needed Vendor contacts and more. 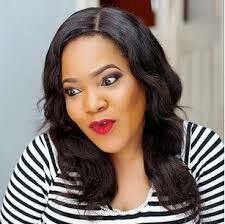 Fee: N50,000, N25,000 (students with ID card). Pay to Classy Touch Venture, GTBank, 210-736080-110, then send your name and payment details to training@classytouchevents.com. Date:27th to 30th June. Participants also stand a chance to win freebies. Learn from the best, our over ten years experience added to that of other event management companies onboard is bound to surpass your expectation.